As the days count down, my stress level seems to be steadily climbing and I’m not even really sure why. I mean, there isn’t much to stress about. I’m marrying the love of my life, almost everything is booked and paid for, and other than the last minute things that can’t be done any sooner, everything is pretty much done. Yet I stress anyway. Invitations were mailed out yesterday, making it sort of “more official” and then someone tells me to add 10% to my guest count for people who don’t RSVP. So, for the next two months I’m going to be dreaming of tropical breezes and adventures in Costa Rica, not stressing about RSVPs. And tropical paradise means tropical paradise-y food. Like salmon tacos, perhaps. Like these salmon tacos. I would say that J and I eat salmon either once a week or once every two weeks, at the longest, so I’m always looking for new ways to make it. Salmon tacos could be a hit or a miss, depending on what accompanies them. But, with this slaw and Sriracha aioli, there was no way for this one to be a miss. Sriracha is becoming one of those ingredients that is making an appearance more and more often in our kitchen these days and that spicy kick it gives to…everything…is one that we love! It goes great with the cool, creamy slaw and crispy, grilled salmon. Make these tonight and pretend you’re in tropical paradise with us! In a medium bowl, whisk together mayo, lime juice, rice vinegar, garlic, Sriracha, and sugar or honey until well combined. In another bowl, combine the cilantro and slaw mix. Stir the mayo mixture into the slaw mixture, a little at a time, tossing to coat. Cover tightly and refrigerate until ready to serve. The farther in advance you can do this, the better the flavors will meld. In another bowl, whisk together the mayo, Sriracha, lime juice, cumin, sugar or honey, and salt. Cover and refrigerate until ready to serve. Heat the olive oil in a medium skillet over medium heat until shimmering. Place the fish in skin side down and cook without disturbing for 4-5 minutes before turning over and cooking for 4 minutes on the other side. While the other side is cooking, use tongs to remove the skin and discard. Flip the salmon one last time and cook the skin-removed side for a couple of minutes. Then, use a spatula to break the salmon up into smaller pieces for the tacos. 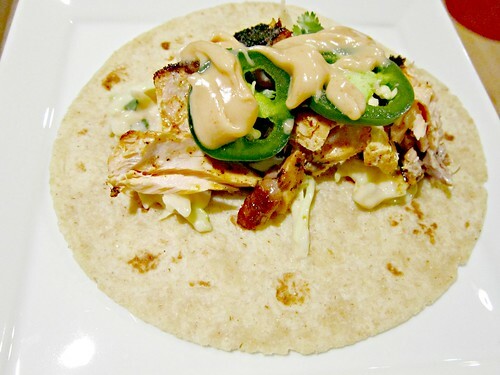 To assemble the tacos, warm your tortillas and top with a couple of spoonfuls of the slaw, a good bit of salmon, some cilantro and jalapeno slices, and finally a good drizzle of the Sriracha aioli. Get your tastebuds ready for some heat and dig in!